Sudoku for Valentines Day and Winter and Christmas and...! Things I've bought on previous Valentines Days: A ring one year, a traditional Teddy Bear another, the Chelsea Flower Show's worth of Roses through the years. Perfume, chocolates for one Valentine Day (they were expensive ones though)and even a cruise one memorable Valentines Day. That's why this year she gets a Valentines Day App! What? No, not really I value my life too highly , but really if my better half was a mad Sudoku fan or an iPad lover than she'd be well served by getting this ever so Romantic Sudoku app for Valentines Day. So how exactly do you make a math logic , puzzler game into a Valentine's Day app? Well quite simply by letting Sudoku Seasons, an already popular and established name by http://www.99games.in/ be presented in an absolutely saccharine sweet and ever so pretty Valentines skin, with teddy bears and hearts and chocolate and such like replacing those ever so boring numbers (or if you're feeling particularly unromantic and your Valentines Day card has been spurned you can still use the number version if you have an unromantic heart of stone) Of course you still have a very solid Sudoku game underneath all this Romantic prettiness. If you fancy a change of season Santa Red ;Mystic Gems Sudoku and other boards can be used in Sudoku Seasons. Still not convinced, than maybe the extra app features such as network Sudoku play , varying difficulty levels and the ability to send a virtual Valentine's Card via iPad will make your heart melt for this app. Traditional and stern Sudokuists might chafe against the idea of using symbols instead of numbers , but if you can make the mental mind shift than this is not only a very cute iPad diversion, but a very good Sudoku game in it's own right. 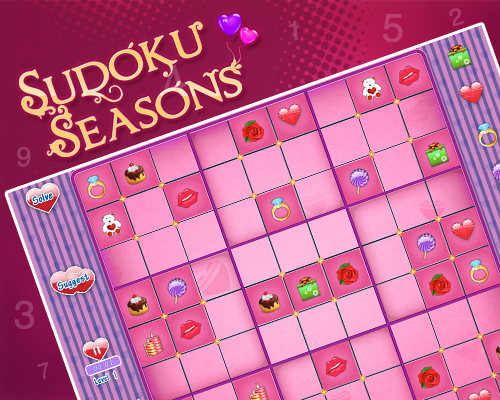 Thank You for reviewing our game 'Sudoku Seasons' - Valentine's Edition. We hope you had as much fun in reviewing the game as we had while making it.